To play off Lawrence O’Donnell’s analogy during MSNBC”s post-debate coverage, President Obama looked like the defense attorney during the first presidential debate. Mitt Romney looked like the aggressive prosecutor, and he was quite successful in that role tonight. I’m not talking about whether you agree on any issues of substance, I’m simply talking about debate style and body language. Mitt Romney aggressively directed his attention right at President Obama on multiple occasions. President Obama on the other hand seemed to focus most of his attention toward moderate Jim Lehrer or the camera. President Obama clearly decided not to go on the offensive in this debate. Where was Mitt Romney’s “47 percent” remark? Where was immigration? Or how about women’s rights? And is Bain Capital now old news? I realize the direction of the debate was steered by Jim Lehrer’s questions, but there is nothing stopping a candidate from speaking his mind on any domestic issue, which was the focus of this debate. Maybe team Obama thought the best approach for the first debate was to play it safe, but they better adjust course for the next debate. 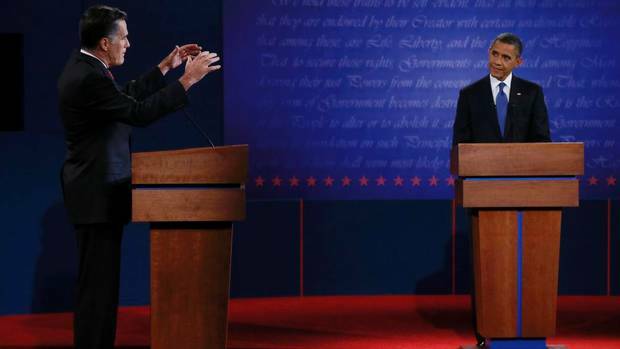 While Romney still has a huge uphill battle because there are so few undecided voters left in this election, two more debates like this could have an impact.